From a garden in my dreams. I love these 4 vintage botanical images. The lilac is from an antique gardeners book, circa 1890’s. 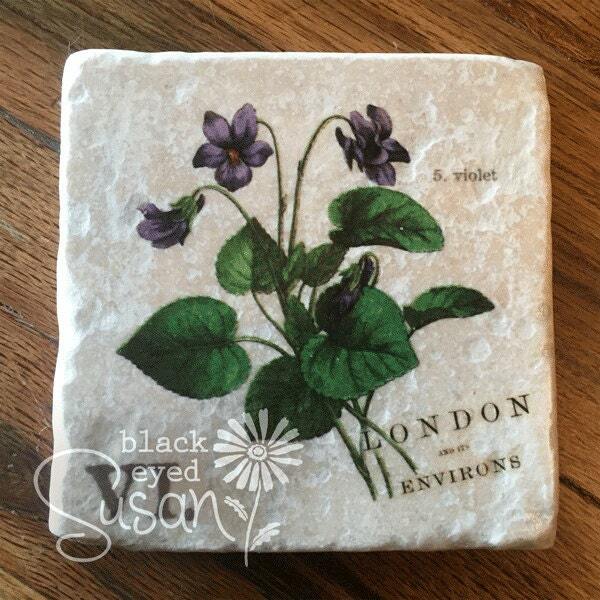 The violets were found in a botanical book from Germany, circa 1890’s. 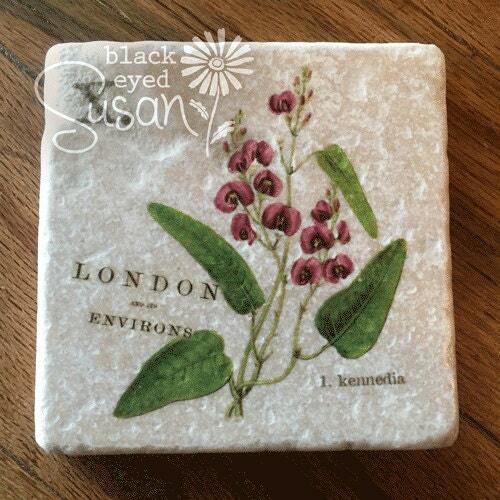 The Kennedia was originally a hand colored engraving from a London Magazine, “The Botanic Garden,” circa 1840’s. 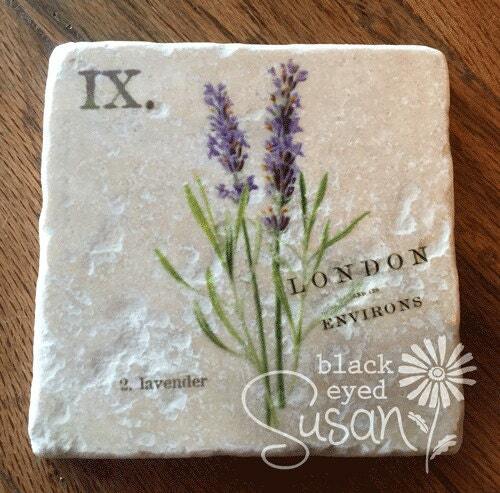 The lavender image is circa 1880’s. This coaster set has pillows to complement with the same designs, OR you could customize other pillows with any number of my complementary ink colors, in Henrietta, Mulberry and Old Violet. 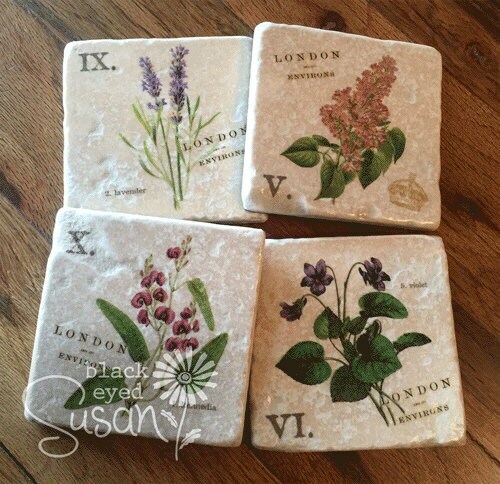 These coasters are made of travertine stone, prepared with sanded grout to help work out surface issues before their artwork. After applying the artwork, I seal these with several layers of a high performance polyurethane, considered the hardest and most durable consumer polyurethane topcoat in the industry. 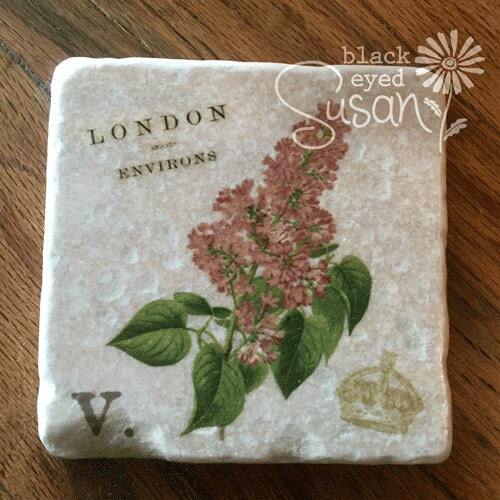 Each coaster is cushioned with a chocolate brown felt adhered to the underside. Printed surface may vary slightly due to handmade nature in the process and variations in the natural stone. Quantity: 4 Coasters are sold together as a set. Wipe surface clean with water, and mild detergent as needed. I require full payment prior to beginning your order as each item is handmade by me. You can pay through my Etsy shop via Credit Card or Paypal, or contact me directly and I can send you an invoice to pay online. I ship USPS and provide tracking for all orders. I begin creating your item once I receive your order. I try to ship your handmade items within 4-7 business days of receiving cleared payment unless otherwise stated. Custom orders occasionally require additional time to complete, as each piece is handmade by me, and I desire to ship you the highest quality completed piece. Please see our store banner for any updates regarding the current shipping times, particularly during busy seasons. Local orders can be picked up to save on shipping charges. Use code: LOCALPICKUP at checkout, and charges will be removed. I will contact you as soon as your item is ready for pick-up. For International Shipments, parcels traveling via USPS International services typically arrive within 2-6 weeks. Please keep in mind that this length of time is largely dependent upon the processing time in Customs. Depending on how quickly Customs processes it, it can arrive a few days sooner, or a few days later than the average. I will provide you with an international tracking number. In viewing the USPS tracking report, you will find the initial date that the parcel was scanned into the USPS system, the sorting date that it was scanned in before leaving the US, and finally, the delivery date. *PLEASE NOTE: Import duties, taxes, and charges are not included in the item price or shipping cost. These charges are the buyer's responsibility. Please check with your country's customs office to determine what these additional costs will be prior to bidding or buying. Custom designs are not eligible for return, unless there is an error on my part in it's creation. But I will always make every effort to serve you well! Wow! 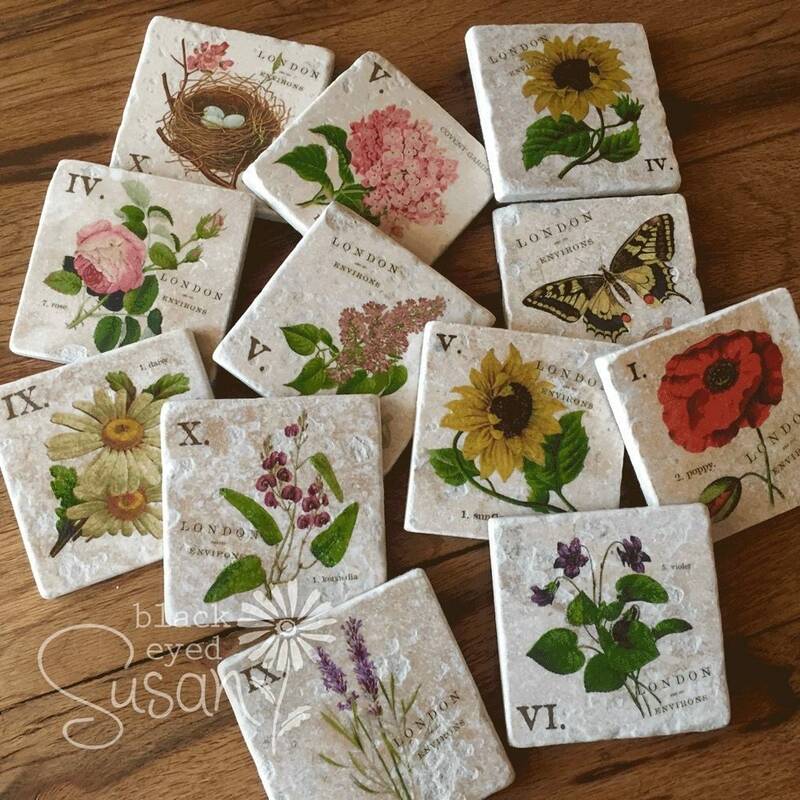 Simply fabulous set of coasters that show beautiful craftsmanship and elegance to be used for home entertainment. Nicely wrapped and well packaged for shipment, too. Thank you! © 2019 Black Eyed Susan Home .